Thanks for the fantastic scans Jeroen! As far as continental hilts from this period are concerned, there obviously aren't as many available to us today owing to the lack of grave-goods, but there are still a good number, and we also have a great number of illustrations, which are sorely lacking when it comes to viking arms. Type S pommels appear in the Codex Aureus of St. Emmeram, the Vivian Bible and several times in the Stuttgart Psalter, all of which appear gold in color. There is also a donor image which appears on the wall of St. Benedikt which depicts a type S pommel that would seem to bear the sort of plating under discussion in this topic, but this is not clear. Type H pommels also occasionally appear in period artwork and have been found throughout areas of Frankish influence, especially along the Rhine, as have type X. Type K pommels have been found bearing floral/vine engravings which are Frankish in style, and the type is generally considered to have originated in this area... though I believe this conclusion has been reached primarily on the basis of the engravings, not on an increased frequency of sword finds within the realm of Frankish influence. Those are the specific examples which come to mind, though there are others. I'll try to dig up a few later today... but to sum up, the swords in the scans you've posted would appear to be fairly typical for the contient during this period. Also... I wanted to comment specifically on the inlays which appear on the swords in the illustrations you've posted Jereon... they're incredible! I have only seen one sword previous with such designs running the full length of the fuller, some pictures of which appears below. I'd love to see a photograph of these! The sword appearing on the far right of the second illustration is especially remarkable in its detail, almost having the appearance of an engraving. Thanks again! Many thanks for the scans and the link Jeroen, very precious to get links to such websites. I just ordered a few documents from Halos. Here's one reproduction. It gives you some idea what the hilt would look like if it was very highly polished. The pic is from a finnish armouring society's web pages. They have some other cool stuff to see at the "myytävänä" section. Unfortunately they don't have a search function, but if you f.e. 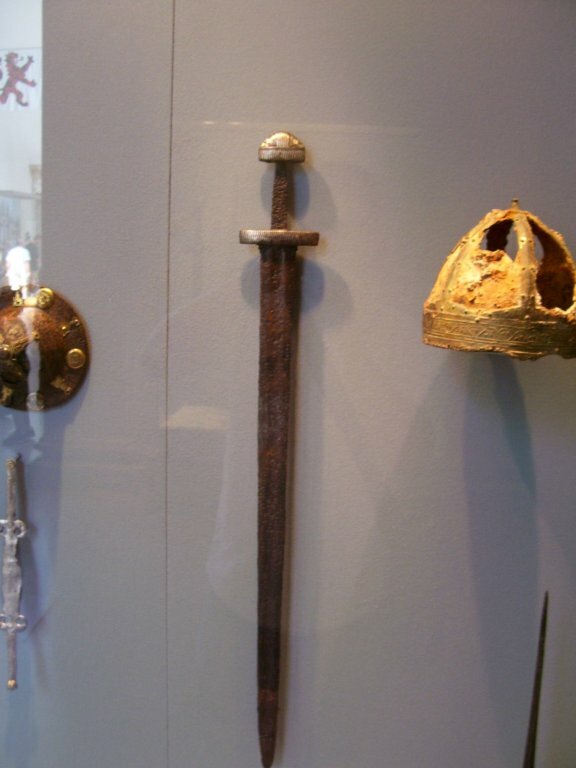 check for Ypey under "The Netherlands, Belgium and Luxemburg (W - Z)", you'll already find quite a lot of publications regarding swords and saxes of the early medieval period and Viking period. Does anyone have any idea if the anchor grooves are just normal channels or if they are somehow undercut? The originals I've seen were a little too rusted to tell, but a 'normal' channel for this type of inlay is an undercut one. I have a couple of relatively good quality photos of inlaid hilts to show. the pics are blurry but this is a sword from the MET. Below is pictured my version of the type H sword from the Netherlands. I have been experimenting on pattern-welded inlays for my doctoral thesis in archaeology, and this blade is one of those experiments. The blade is 18th-century steel and the inlays are pattern-welded. Having enough bare blades at the corner of my livingroom, I have been trying to make hilts according to some finds. 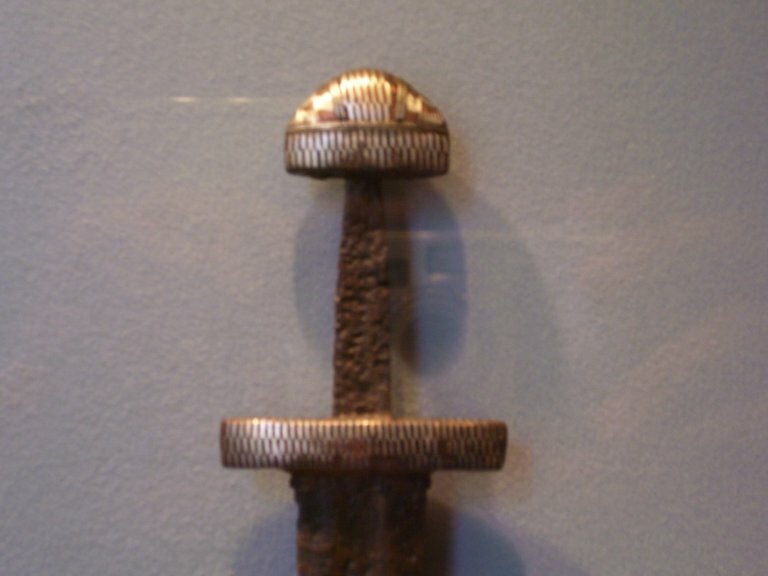 The hilt for this sword, as well as the measurements of the blade, were taken from the find from Netherlands. 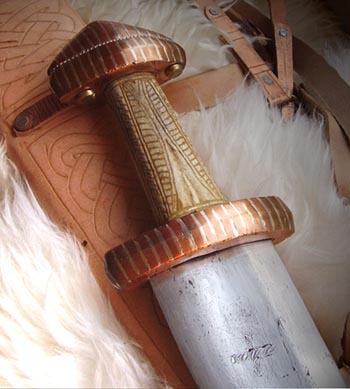 The hilt is iron, covered with copper and silver wire inlays. The inlays were attached by undercutting channels for them. The inlaid wire was 0.8 millimetres in diameter, so the number of inlaid wires is much smaller than in the original. In my version there are inlaid alternately one silver wire and two copper wires, while in the original every strand is comprised of several thinner wires. The guards were forged, as well as the hollow pommel. I used a kind of resin to attach the U-shaped rivet inside the pommel. The resin was quite the same as previously talked about in this thread: mainly pitch, some beeswax and wood filings as binder. The mixture held surprisingly well, although it is very sensitive to changes in temperature. 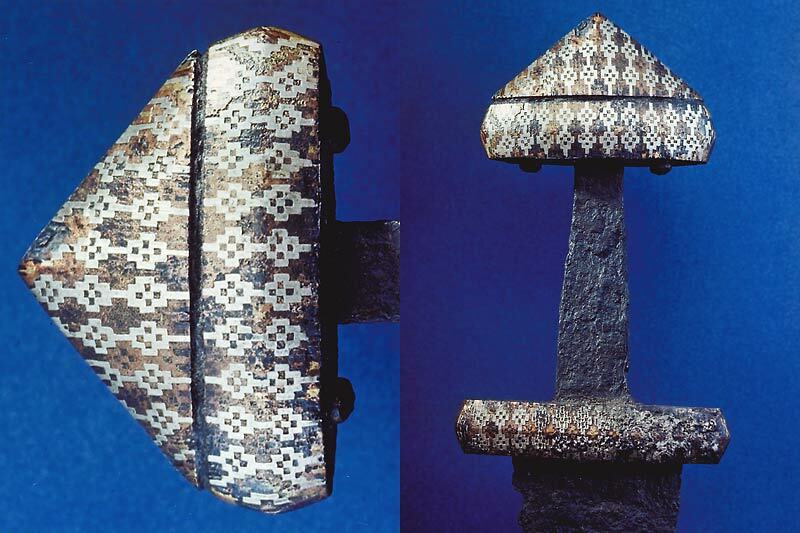 The decorative wire between the pommel and the upper guard is beaded silver wire. Comments and thoughts are very welcome! Mikko That is some stunning work!!.. I love it. did you do all the inlay with traditional tools and no power tools?? And the grip looks beautiful! what is it crafted from?? Andrew, thanks for the comments. All work was done with traditional tools. The chisels with which to cut the grooves for the hilt inlays were self-made. Actually, only hammers and anvils are industrial, all other tools are made from scrap iron and steel. Everything was done without electric tools, excluding the air blow in the forge. The polishing work was also done with different grinding stones, fine sand and various pastes available also to the Iron Age craftsman (or so I believe). The grip is carved antler, a very thick one. Actually the model can be found in Historical Museum in Stockholm. There is a sword (with its blade missing, Petersen type V if I remember correctly), which has a same kind of grip made from bone or some horn. Even the majority of the decorative carvings are preserved. You do also excellent work! I noted your homepage already a long time ago. The blades look elegant, and especially I like the carving work! 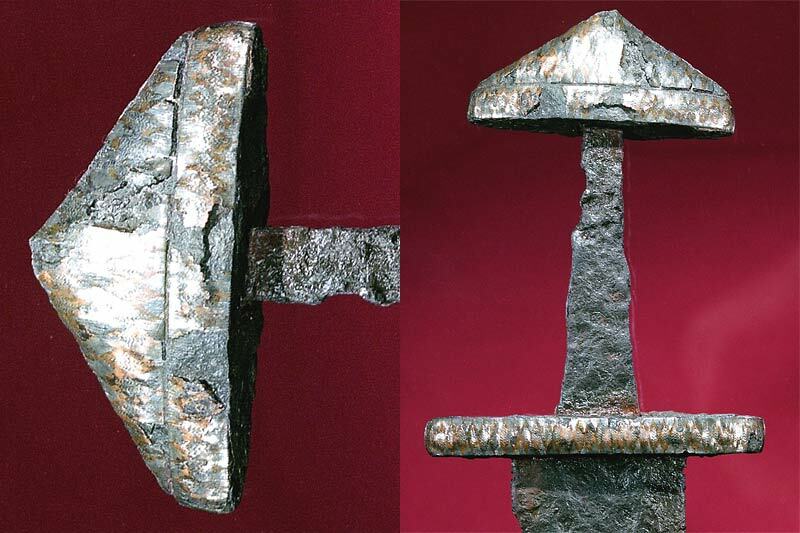 Wow... That is some amazing work, especially considering the use of iron age tools and methods. I love experimental archeology. It is fascinating to see such a fine reproduction of the very sword that started the thread. Thanks so much for taking the time to post your work. And please feel free to show us more of your work. And tell us what you've learned.